Are you the king of the swingers? The jungle VIP? Happy Jungle has been under a bit of refurbishment recently and the monkeys and baboons have been doing a bit of light decorating. The curtains now match the drapes in this deluxe version of the Happy Jungle series. Spin through reels filled with grinning chimps, hippos, and bonus fruit wilds to generate some online slots free spins and cash rewards. Here at Wizard Slots we love Playson. Playson is already a well-established online games developer specialising in high definition graphics and technologically innovated games. Since 2012 they have burst onto the online casino scene providing this industry with a breath of fresh air and creative enthusiasm in each one of their games. If you’re looking for a game that has it all then look no further. Step into the exotic jungle with this online slot game from Playson. And as you would expect from a Playson game, Happy Jungle comes with stunning graphics and animations. The whole game screen is a lush display of leafy greens, white sands and blue sea transporting your straight into the heart of paradise. Foliage isn’t enough, though is it? You’ve also got colourful lizards, birds of paradise, monkeys, lemurs, hippopotamuses, giraffes and lions. There is even a little penguin in there to make you smile. 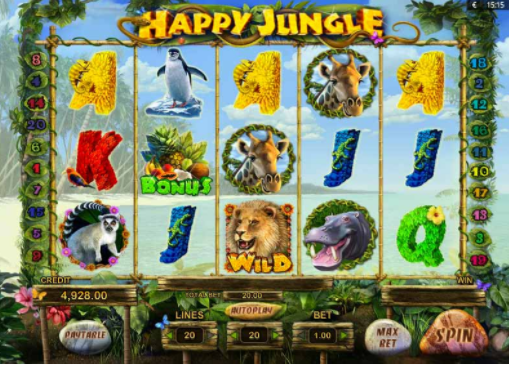 This online slot game comes with 5 reels and 20 paylines full of playful jungle vibes and bonuses. As soon as you spot the mane of a lion on your reels you know you are in for a treat as the Lion acts as the Wild symbol in this game. The Wild can substitute any other symbol except the Scatter. The Scatter is the Lemur symbol and he can multiply the winnings of your total bet! If you manage to find 5 Scatters on any of your reels you will win 15x the value of your bets! There is also a Fruity Bonus symbol shown as a hamper of tropical fruits with the word ‘Bonus’ written in bright green letters. Finding 3 of these symbols on your reels will reward you with 15x your total bet prize and it will also trigger the bonus game. This nifty feature will show you a huge tree house with many different levels and doors. All you have to do is open a door on each level to see what lies behind. If you find a fruit symbol you will win a random prize and be able to progress on to the next level, but if you don’t and there is nothing behind the door you will then go back to the main game. If you’re lucky and you manage to work your way up to the top of the tree house you will be rewarded with 25 free spins! 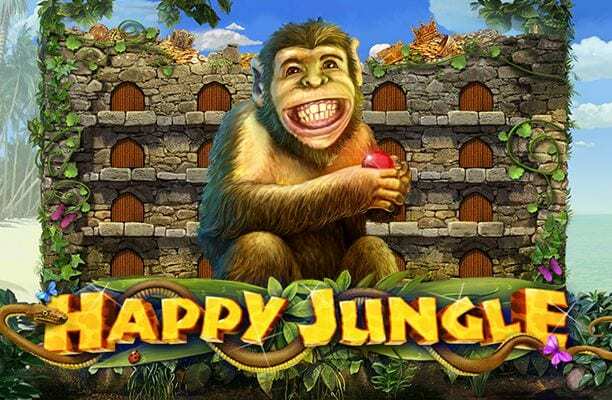 Happy Jungle is a game that will always keep you smiling, with its happy and vibrant theme to its big cash prizes there is something here that everyone will love. Playson have expertly captured the excitement and exotic life with this wonderful jungle themed game. Aesthetics aren’t everything though, and this online slot game comes with big winning potential, enticing bonus games and an amazing doubling Wild symbol. Playson have pulled out all the stops with this game and you will not be disappointed. While most people probably wouldn’t want to get lost in the middle of a rainforest, with Happy Jungle Deluxe you will never want to go home! A game that is similar to Happy Jungle is Shaman's Dream.